I was crafted for travel agencies, bloggers and other roadsters. You will be amazed by its stylish astonishing design making your company stand out from your competitors. You donâ€™t need any coding skills to customize Journez and add you own custom-made elements, because the theme was built on Elementor drag and drop page builder. This user friendly page editor is enhanced with JetElements plugin - a specially developed addon with multiple exquisite modules and extended functionality. 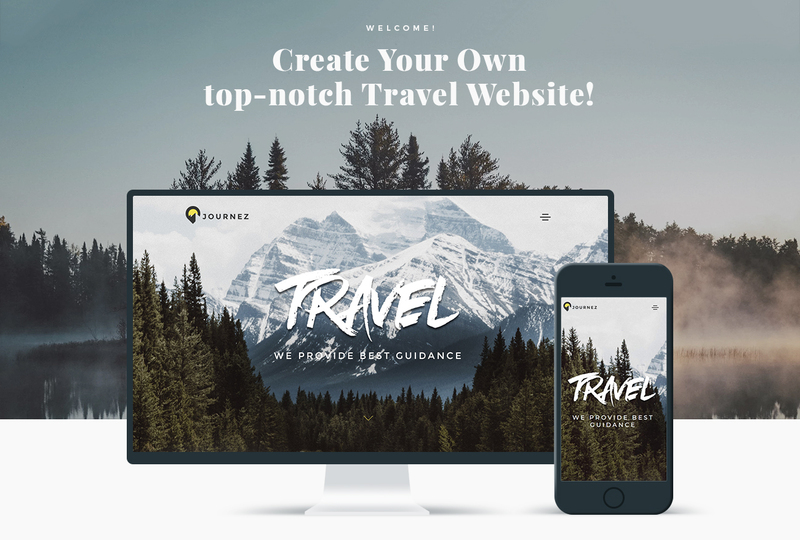 Journez Travel theme contains a brand-new JetThemeCore plugin, which allows to create custom-made headers and footers, as well as use pre-designed ones and customize them according to your needs and vision. Except these plugins, you will get powerful Jet Family plugins - JetBlocks and JetTabs. JetBlock plugin makes it extra easy to add authorization links, hamburger panels, login forms and customize other elements. JetTabs, in turns, allows adding stylish tabs and accordion widgets with vertical and horizontal layouts and building content inside them using Elementor live page builder widgets. Also, discover adaptive design, extra widgets, Google fonts, SEO-friendly code, and much more in Journez! Retina Ready WordPress themes are templates that will be able to adapt to Retina displays and always look sharp and bright. Your current pictures and the entire website content can look well-defined and beautiful. Colors are stunning, bright and it makes your internet site to look far better on almost any device. It is a internet component which helps to set up a quantity of data storing the live demo content. Sample Data Installer minimizes manual customization, hence helping you save a lot of time. Feel free to use the module with any WordPress template offered at TemplateMonster marketplace. In case you find out or expect that your target audience speaks a multitude of foreign languages (sometimes they are from various places or they can be linguists), you'll need your webpage to be designed in more than a few spoken languages. WPML plugin offers a multilingual switcher to the internet page, enabling the visitor to instantly change the web page's language. It is possible to increase the volume of potential customers and make your internet site international. In addition with WPML, search engines recognize the structure of your internet site and direct the right traffic to the right languages. This is actually the ability of the layout to change according to the width of the screen. Search Engine Ready is the type of web design that allows search engine spiders to explore and index its pages. The Search Engine Friendly web template is definitely a seamless general platform to start out selling and also improving research rates of the webpage. It is really more convenient to work with this type of webpage for Search engine optimisation expert as part of the work is previously completed. Elementor page builder is a drag-n-drop WordPress website builder meant for non-coders. It is easy-to-use and has an user-friendly admin panel which enables even newbies to build a pixel-perfect pages and posts like a professional. Drag-n-drop functionality makes the entire process simple and quick. Make sure that these charges for Trip Planner WordPress design have different order IDs. If it is so, contact our billing department. Can I customize the WordPress design for Travel Accessories? Yes, you can customize the WordPress design for Travel Accessories to any extent needed. You cannot use a header of the template for one project though, and images from the template for the other project. What do I receive when I order a WordPress design theme for Travel Services from TemplateMonster.com? After you complete the payment via our secure form you will receive the instructions for downloading the WordPress design theme for Travel Services. The source files in the download package can vary based on the type of the product you have purchased.If you need unzipping software to open the .zip archive, Windows users may visit www.WinZip.com, Mac users may visit www.StuffIt.com. Is there any return policy for WP templates for Travel Luggage Shop? Requests for a refund are accepted at www.template-help.com/tickets within the period of 2 weeks after the order of Travel Planning WordPress theme is placed. You should accompany this request with detailed and grounded reasons why you apply for a refund. Please make sure your request does not contradict the terms and conditions specified in the policy. A refund is issued to you upon receipt of a Waiver of Copyright signed by you. 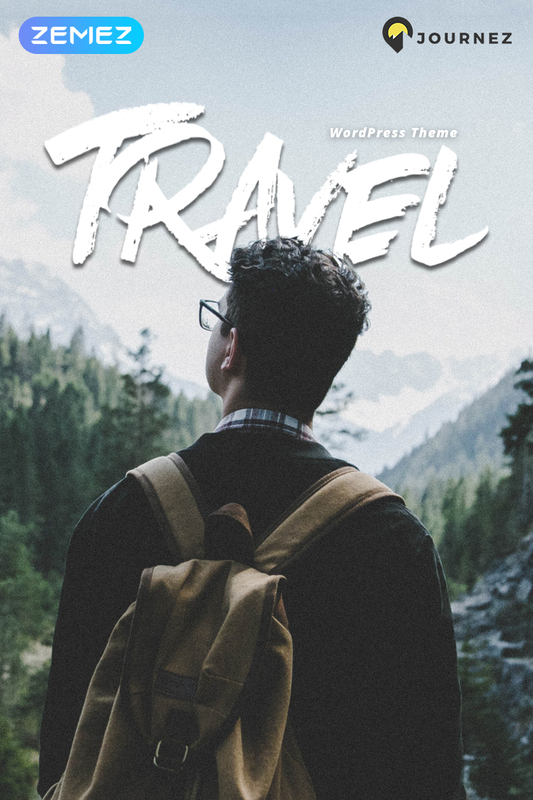 Can I get the WordPress template for Travel Supplies in higher resolution to use for printing? No, we design Travel WP templates optimized for web resolution only. What is a one time usage license for a WordPress design theme for Travel Advice? When you buy the WordPress design theme for Travel Advice at usual price you automatically get the one time usage license. It enables you to use each individual product on a single website only, belonging to either you or your client. You have to purchase the same template again if you plan to use the same design in connection with another or other projects. When passing files to your client please delete the template files from your computer. Can I resell WordPress design themes for Tourist Accessories I bought the developers license for? You cannot resell the customized WP template for Travel Shop as a template, but you may sell it as a project to your client. Is it possible that Template Monster will contact my client which website I made from Template Monster's website WP template for Trip Assistant? Yes, our legal department checks licenses regularly. In case we won't find designer's contact information on the site which was made from the WP template for Trip Assistant of ours we will contact the owner of the site directly. Are there any limitations on selling the WordPress design for Trip Shop as the integral part of my new product? I would like to make payment for WordPress design for Outdoors Sports and Travels by company check. Is that possible? Please use Skrill payment option. They accept payments by check.You can place an order for WordPress design for Outdoors Sports and Travels on the site under the name of the company and choose Skrill merchant system for making payment from the company's account. To initiate bank transfer, please create an account here - www.skrill.com, add the number of your bank account and verify it. After that, you can place an order on our website and choose Skrill on checkout page. When the payment is made, the product will be sent to your e-mail along with the invoice under the name of your company. Can I resell the WP template for Travel Gear as is? No, you cannot resell the WP template for Travel Gear as is. Yes. It is perfect for designers who want to offer their customers a high-quality design and also save time and money. 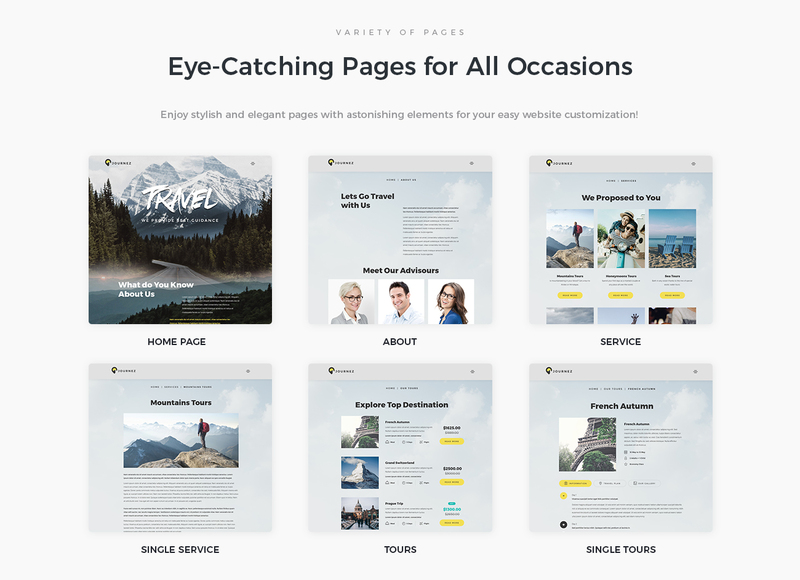 Keep in mind that when you purchase the WP theme for Travel Guide with ordinary or exclusive license you're entitled to create only one project (one domain name). Will you help me to customize my WordPress design for Vacation Guide? We do not provide any help or instructions on WordPress design for Vacation Guide customization except for www.template-help.com help center. If you are not sure you can customize the template yourself we recommend to hire a design studio to customize the template for you. What are the advantages of purchasing a WordPress template for Travelers? The major advantage of purchasing a WordPress template for Travelers is price: You get a high quality design for just $20-$70. You don't have to hire a web designer or web design studio. Second advantage is time frame: It usually takes 5-15 days for a good designer to produce a web page of such quality. Can I integrate the WordPress design theme for Travel Guide Company with third-party software or applications for development of my new products? No, you cannot get the developers license for development of WordPress design theme for Travel Guide Company or other products. Can I use graphics from Travel Gear WordPress template I purchased for use in printing? Yes, it's not prohibited to use the Travel Gear WordPress template graphics for printed material, but the resolution of the templates graphics ( except for logo templates) is not enough for printing. I ordered a WP template for Travel Shop but haven't received the download information. In case of not receiving the download information of a WP template for Travel Shop, please contact our Billing Department via support chat by phone or e-mail. Can I apply a discount code to a discounted Travel WP template or combine several discount codes together to get better price? What is Extended License for WP template for Trip Store? Can I put low resolution thumbnails of WP themes for Travel Tickets on my website for my clients to choose designs? What is a buyout purchase license for WP theme for Travel Blog? If you purchase the product at a â€˜Buyout price' it guarantees that you are the last person to buy this template from us. It means that this WP theme for Travel Blog may have been sold before a couple of times (see â€˜Downloads' number in item's properties) but only you and people who bought the template before you will own it. After this kind of purchase the template is being permanently removed from our sales directory and is never available to other customers again. The buyout purchase license allows you to develop the unlimited number of projects based on this template, but the template should be customized differently for every project. Can I resell the customized WordPress template for Outdoors Sports? No, you cannot resell the customized WordPress template for Outdoors Sports as a template but you may sell it as a project to your client (see paragraph 1 ONE TIME USAGE LICENSE for more details). Can I put a line at the bottom (or any other spot) of my new product "Website development by Company name" after purchasing WordPress template for Travel Supplies? Yes, you can place a note at the bottom (or any other spot) of my product "Website development by Company name". Nevertheless, you cannot place "Website design by Company name"while using one of WordPress template for Travel Supplies.